Direct boxes have come a long way from the basic models we relied upon 25 years ago. Today, entire guitar and bass preamp sections have been placed in pedals and paired with XLR direct outs for playing and recording without big rigs. 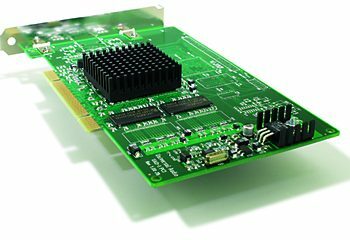 Bass players have been relying on the Tech 21 SansAmp family of products for nearly 30 years, while guitar players have commonly relied on DIs from L.R. Baggs, Fishman, and others. Of course, today, Tech 21 has a wide range of solutions for guitar players, too, including the subject of this review. In designing the Q\Strip, the engineers at Tech 21 took a new approach. Rather than stuffing an amp in a pedal, they sought to capture the sound of classic ‘60s and ‘70s recording consoles (mixing desks) and create a DI that facilitates direct recording without imparting the sound of a guitar or bass amp. 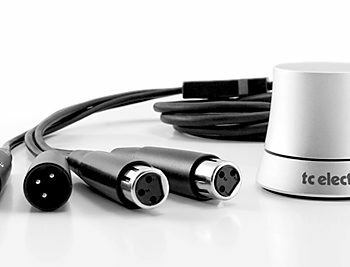 The Tech 21 Q\Strip provides a perfect solution for direct recording and live sound that will find a home with guitar players, bassists, and keyboard players. It has all the right capabilities to be a useful stage DI, and sound quality suitable to the studio. This is one of those products that really doesn’t do anything to stand out among your gear, yet it’s something you’ll reach for over and over again. Housed in a compact and rugged aluminum box, the Q\Strip is a smart looking DI with its brushed grey casing topped by red aluminum knobs, lending it an air of Swiss-army appeal, as it’s so useful in so many different scenarios. The Q\Strip features 100% analog, MOSFET circuitry, similar to that found in classic consoles, and its functionality is pretty obvious at first glance. The pedal features four bands of equalization, with two of them offering parametric control (one from 40Hz-700Hz and the other from 300Hz-6kHz). There’s also a high-pass filter preset to 45Hz, and a low-pass filter preset to 3kHz, each attenuating the signal at 12dB per octave. The pedal has a quarter-inch instrument input and multiple outs: a quarter-inch, parallel output that is hard-wired to the input jack and sends the signal straight out, completely bypassing the pedal’s circuitry (useful when used in combination with your amp/rig); a quarter-inch output that passes through the MOSFET and EQ circuitry; and an XLR direct output. The EQ circuitry can be bypassed via a Carling-style footswitch, though this obviously does nothing to the parallel output. There’s a +10dB pad for the quarter-inch output, a -20dB pad for the XLR output, a ground lift switch, and best of all, you can forgo optional 9V battery use and let the pedal run directly off of your mixer’s 48V phantom power. There is also a standard 2.1mm jack for supplying the Q\Strip with 9V DC 100mA center negative power from your pedalboard power supply. The Tech 21 Q\Strip is as straightforward to use as anything else in the company’s product line, which is to say that it’s a piece of cake. Just plug in, make sure you’ve got power, and go. We found it very easy to dial in appropriate sounds for guitars, bass, and keyboards, and in our guitar/bass applications, we found another use for the parallel output: connecting an instrument tuner! We powered the Q\Strip with phantom power coming from our PreSonus StudioLive console without any issues. 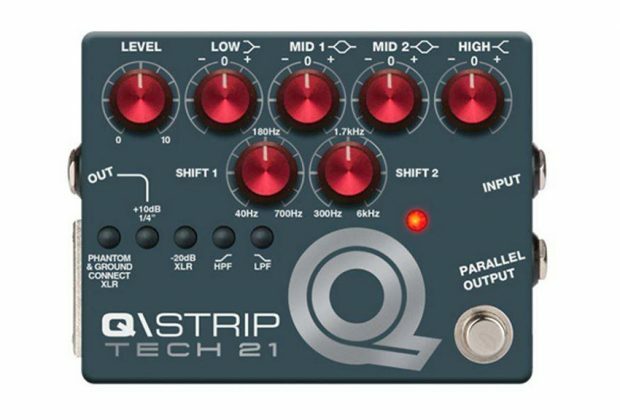 Many classic records in the ’60 and ‘70s were made with guitars and basses plugged directly into the mixing board, and the Q\Strip delivers that sound. It’s easy for guitarists to think that they always need an amplifier or modeler, but anyone trying to channel a classic disco vibe is going to love the Q\Strip. Running our Fender American Elite Stratocaster through the Q\Strip, with some subtle adjustments of the EQ and engaging the high-pass filter, delivered classic Motown magic, with that great chicken-picking kind of funky clean. With acoustic guitars or electric guitars with Piezo-acoustic output, the Q\Strip makes an ideal direct box. Playing both a Taylor acoustic and a Breedlove acoustic (with internal pickup systems) through the Q\Strip into a large P.A. system gave us a wide range of useful acoustic tones without feedback. It was easy to pull out the boominess that sometimes happens when amplifying dreadnaught acoustics, and it was also easy to dial in some high-end brilliance without ever getting harsh. We have historically relied upon acoustic guitar DIs from other companies but achieved fantastic results here that never left us wanting for more. Another treat was running the Piezeo acoustic output from Music Man JP-6 and JPX electric guitars through the Q\Strip. We were able to make these premium rock guitars’ Piezo output sound appreciably more acoustic. 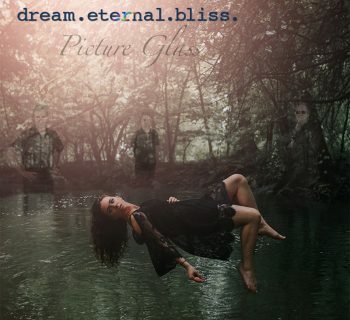 We were also able to obtain fun guitar effects, using the high- and lo-pass filters in combination with the parametric EQ bands to create squashed, narrow-band guitar sounds that ranged from a cocked wah pedal tone to retro, lo-fi stuff. Next, we turned our attention to the bass. Now, bass players are more accustomed to recording direct in the studio, and we know plenty of gigging bassists who simply wish to leave their amp at home, and in both scenarios, the Q\Strip makes a great choice for obtaining classic studio tone without the big rig. We plugged an NS Design WAV4 Radius bass straight in and were able to dial up a wide range of useful bass tones, and it worked suitably well running straight into our StudioLive console and listening through our Ultimate Ears in-ear monitors. For jazz and pop music in particular, the Q\Strip makes a great choice if you want to leave the big rig at home, though rock bassists would be better served by the grittier, Ampeg-inspired tone of the classic Tech 21 SansAmp, VT Bass DI, or the similar Bass Driver DI. Although we didn’t have an opportunity to test this directly, keyboard players should find the Q\Strip useful as a sophisticated DI box, too! The tone-shaping features provided by the parametric EQ can really clean up the sound of vintage keys like a Rhodes or Wurli. Stick a pair of these in your rig and you’ll have a nice stereo DI solution. Once again, Tech 21 shows us that they know how create meaningful product documentation. Although the basic operation is self-evident, the outstanding user’s guide is full of sample settings for different guitar and bass tones, speaker cabinet emulation sounds, and blank templates on which to notate your personal favorite settings. The Tech 21 Q\Strip (MSRP $350) sells for approximately $250. It’s not the cheapest kid on the block, but certainly one of the best. Truly, there’s something in the Tech 21 Q\Strip for everyone. It’s a great live DI box for acoustic guitars and basses, and a great studio tool for direct recording. 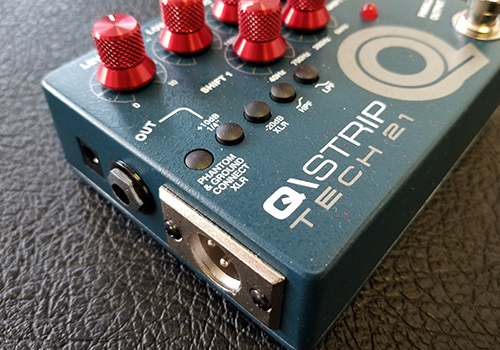 Considering that you can also use it for keyboards, the Q\Strip is one of those items that any gigging or recording musician would find useful to have in their gig bag. It’s one of those special products that doesn’t draw any attention to itself yet helps your other equipment to sound better.